To get on page with God’s purposes for the Church, we first need to listen to Him with our ears, and our heart, to learn what that purpose is and then we live it out. In John 10 we see both of the above definitions in the illustration of us being like the sheep with their Shepherd. In verse 3 we read “that the sheep listen to his voice” and then verse 4 says “his sheep follow him because they know his voice”. As we continue to read this passage, we discover that it only makes sense to listen to God. A personal relationship with God forms the foundation for listening to Him and continues to be the driving force in following after Him and His purposes. 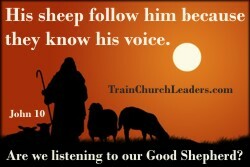 We are here for His purposes so it only makes sense to listen to Him and follow where He leads us. Because we belong to Him, we should be listening to His voice above, even to the exclusion of all others. When we listen to the world, rather than our Good Shepherd, the Church loses its life-giving dynamic that can only be found by listening to Him, following His purposes, and doing what He says is most important. Because He is a Good Shepherd who loves us deeply, He will tell us what we need to know and it will lead to the best life we could know — one in which He not only provides for but also protects us. A good material for church leaders, that can be used to develop leaders. Yes, Dhikange Moses. This particular post is especially foundational for developing leaders, as well as veteran leaders, to remember. If we aren’t listening to God, who are we listening to? How will we get to where He wants us to go?